Our Welding department can handle even the most complicated projects. Whether it's TIG / Heliarc (GTAW), Brazing, MIG (GMAW) or Flux Core (FCAW), our certified personnel will develop the right process to hold precision tolerances throughout the welding procedure. From the thinnest sheet metal to the thickest plate, machined parts and structural, Burgess will meet and exceed all of your welding requirements. Spot welding of steel, stainless steel and aluminum is achieved on our Amada 90KVA welder. 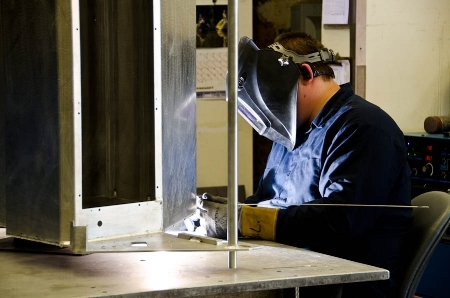 Many different products must be spot welded to maintain manufacturing specifications. We are able to handle this process, giving our customers quality parts to the required specifications.